The markets always eagerly await turn-of-the month data in hopes of fresh insight into the pace and nuances of the economy. That eagerness is likely even greater (if that’s possible) this month as much of the 2014 economic data has been distorted by an exceptionally cold and snowy winter across much of the country. March and April data are expected to be less weather impacted and provide better insight into the economy’s progress. In this regard, today’s Institute of Supply Management’s PMI (Purchasing Managers’ Index), is somewhat helpful for fewer respondents cited bad weather as an issue. March’s PMI suggests the economic expansion remains on solid footing with the all-important new orders sub-index suggesting demand for the next several months remains solid and shows no signs of the type of serious inventory gluts that typically precede economic trouble. 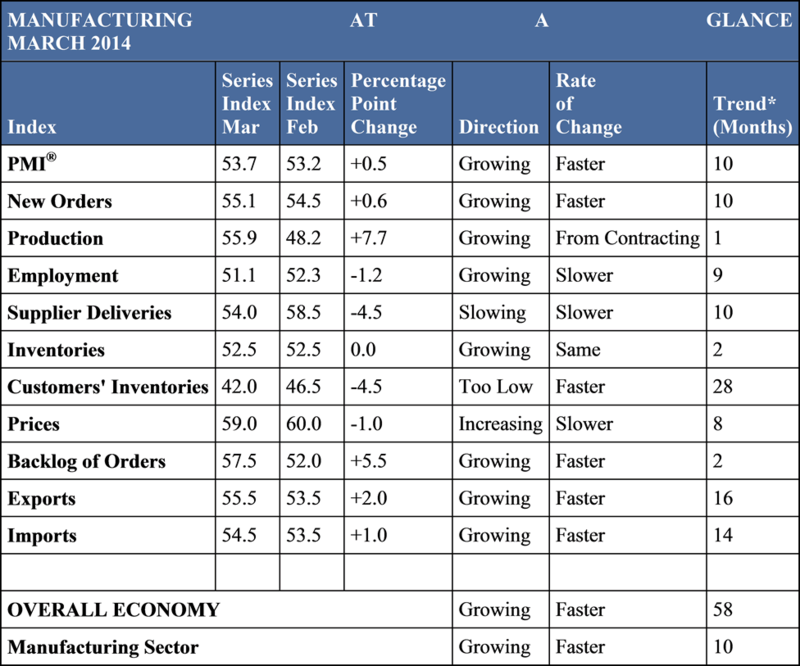 (See table and ISM comments below). The doom and gloom crowd will still find things to worry about for the brunt of the Fed’s QE wind down is still ahead. Those that fear the economy has been on a Fed induced sugar high will not be satisfied until later this year (if ever!) when the economy either proves their thesis or it melts like our rapidly disappearing snow. We expect the economy will once again demonstrate its resilience to the change in Fed policy, just as it has to all the other “scary” threats to growth that have been thrown at it since the Financial Panic of 2008-09. We also think the Fed’s extraordinary actions—while essential as the “lender of last resort” back in the Panic—may have reinforced general economic angst ever since. How? By creating both uncertainty about their ability to unwind things without triggering hyper-inflation and a fear that maybe the Fed knows something (bad) about the economic backdrop that market participants are not (yet) privy too. As will be detailed in the upcoming Perspective, Divergent, (to be sent out in the days ahead), the economic expansion likely still has a number of years to run before the combination of accumulated excesses and (eventually) tight Fed policy trigger the next recession. Until then, mini-panics related to macro-economic jitters will occur along the way. But, until the expansion is seriously vulnerable, it will be micro-economics (which companies can grow at a superior pace? And, how are their stocks valued by the market?) that matter the most to investors. From our perspective, the ISM is one of the more helpful general data series for it is less subject to the wild revisions experienced in most monthly economic data provided by the government. As a result, it probably provides better “signals” and less “noise” about the economy. Though manufacturing new orders are viewed as a relatively small part of the overall economy as computed in GDP, the PMI and new orders sub-index are highly correlated to the general economy. In addition, one of the “excesses” that almost always is a precondition for a downturn, relates to inventory levels. The PMI provides timely insight into inventory levels; currently they are viewed as “adequate” to “too low”. They are hardly the types of readings that suggest a worrisome inventory glut. Finally, our manufacturing renaissance thesis expects the manufacturing segment of the economy to grow faster and provide investment opportunity relative to the economy at large. The monthly data helps provide a check-up of sorts on this thesis. ”“Manufacturing expanded in March as the PMI® registered 53.7 percent, an increase of 0.5 percentage points when compared to February’s reading of 53.2 percent. A reading above 50 percent indicates that the manufacturing economy is generally expanding; below 50 percent indicates that it is generally contracting. March 1 (FactSet) — Following is a summary of U.S. manufacturing conditions from the Institute for Supply Management (ISM).